In honour of the 2016 Olympic games, M and I have been experimenting with making patterns from interlinked circles. We started out on paper and then moved onto painting another umbrella, taken from what feels like my endless stash of plain umbrellas which are just waiting for some decoration. 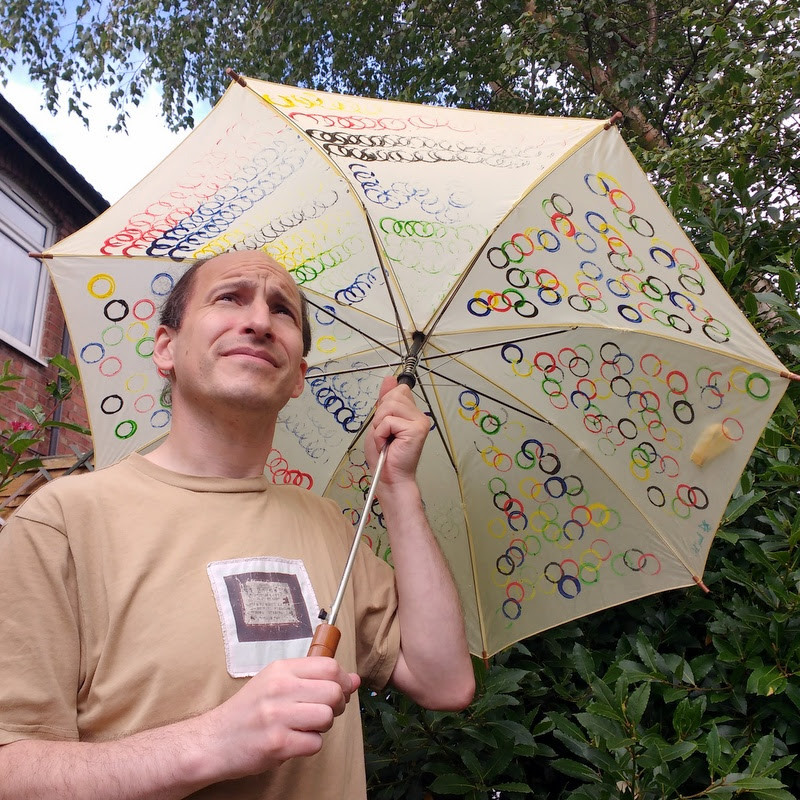 The umbrella was a lot smaller this time and only intended for personal use, rather than a huge golf umbrella. Being smaller, it took a lot less time to paint! I mixed up a 50/50 acrylic paint to fabric medium in suitable Olympic colours, i.e. blue, red, yellow, green and black. For the circles, I cut a dense cardboard tube into smaller pieces. The tube was the kind you find in the middle of aluminium foil or cling film. These are strong and unlikely to disintegrate after being repeatedly dunked in paint. 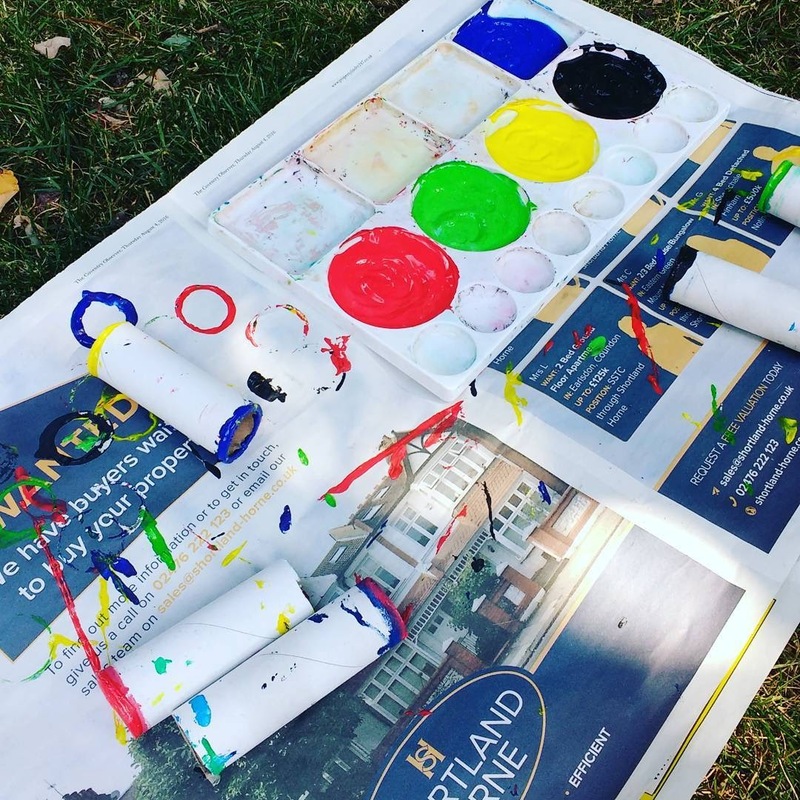 Paint (acrylic with fabric medium) and cut down cardboard tube. All set, we retired to the garden with out paints, cardboard tubes and an umbrella. An hour or so later, we had this umbrella set aside to dry. 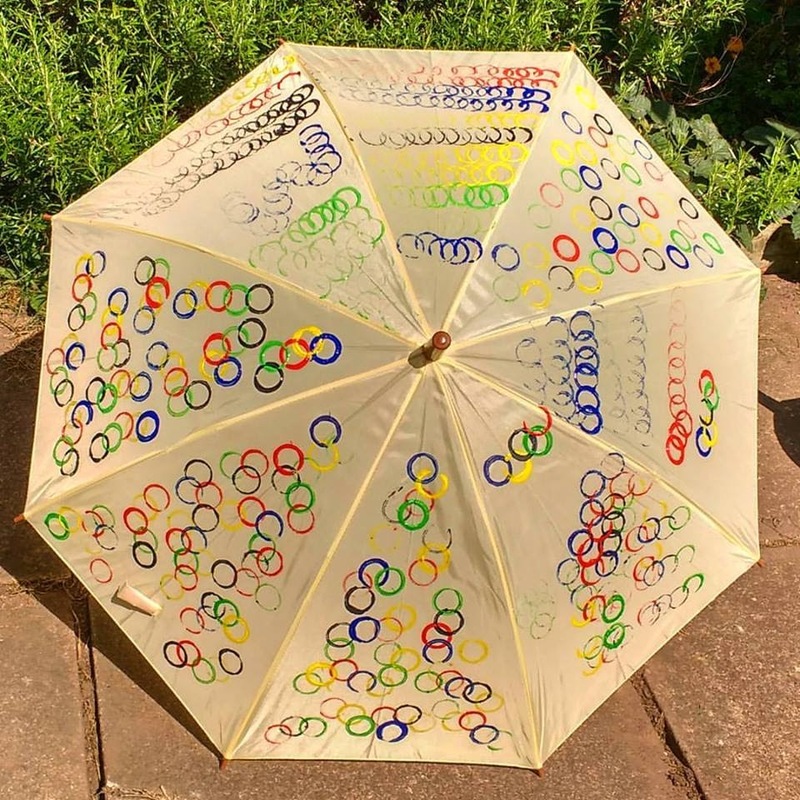 The finished Olympic inspired umbrella set aside to dry. Unfortunately, at this point the wind decided to pick up the umbrella and blow it around the garden. This caused some consternation, not only because of smudges to our newly painted umbrella, but because the laundry was drying on the line! The umbrella was retrieved, I picked off the worst of the vegetation before standing it to dry in the kitchen for the rest of the day. Once it was touch dry we signed the umbrella in sharpie, before transferring it to the shed to continue drying for another three days. At that point, I examined it carefully and peeled off any remaining bits of garden before covering each panel in turn with a pressing cloth, then ironing on high to set the colour. Ironing is a mummy only activity. After ironing, I re-sewed the parasol to the umbrella frame. 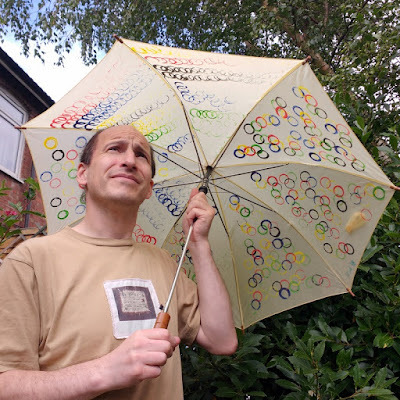 I'm not sure if it was poor workmanship, or the tumble the brolly took around the garden, but several of the stitches had popped so it needed a bit of repair. 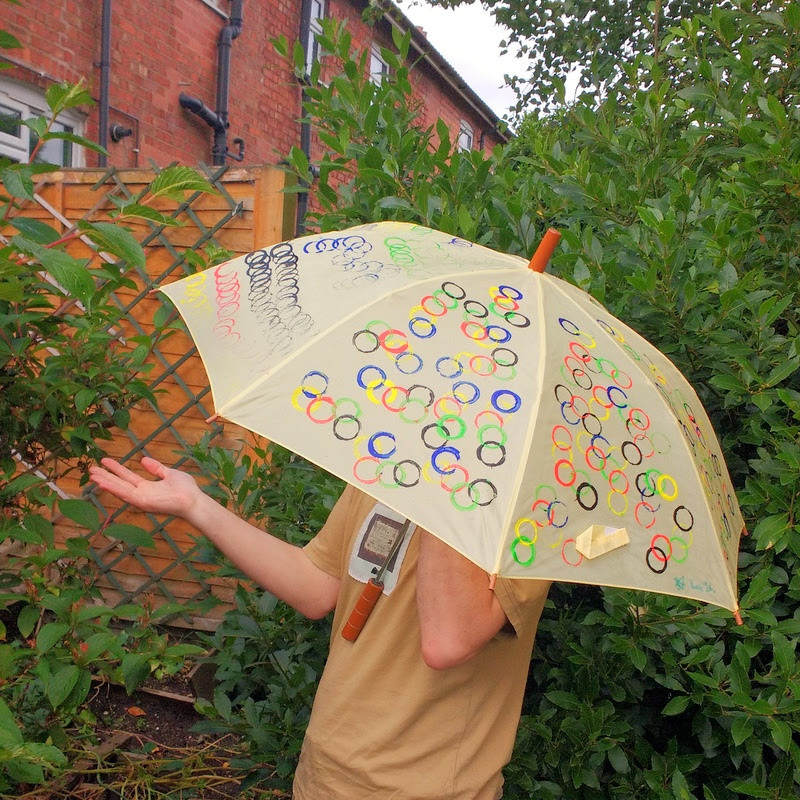 M's favourite part of painting umbrellas is the quality control test at the end, namely testing the umbrella's waterproof properties with a watering can. Personally, I feel that any umbrella which cannot be taken out into the rain for fear of it getting wet, is not much of an umbrella. Waterproof and the colours don't run. 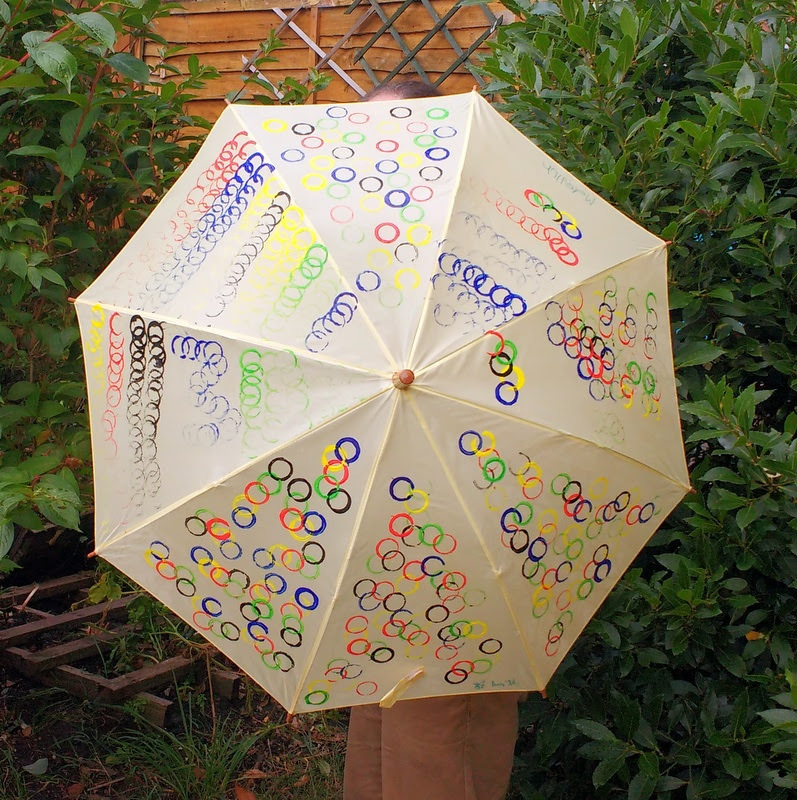 Thankfully, the Olympic inspired umbrella passed the final test with flying colours. And the view from the underside. The artwork on this umbrella was shared equally by myself and M. We both just stamped circles in whatever way we felt like doing, having lots of fun in the process. Again, I think it turned out well and we were both happy with the result.